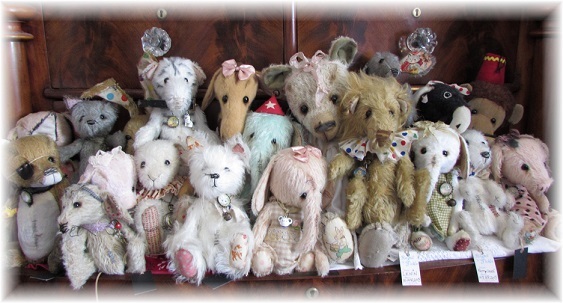 'Ragtail n Tickle' are one-of-a-kind creations, cute jointed bears and other animals, all designed by fairy Artist Charlotte Bird. They are hand crafted in the U.K and are given a vintaged antique feel with the use of aged fabrics and old/aged accessories. Each one is utterly charming and unique. They are all given individual names and they will arrive with an adoption certificate and dust bag. If you are looking for a particular design, and you can't see it on the site, drop us an email, we may have one that isn't listed! Mr Topsy-Turvy vanished into a large rabbit hole only to pop-up here in our little shop! We are just waiting for Alice to arrive! 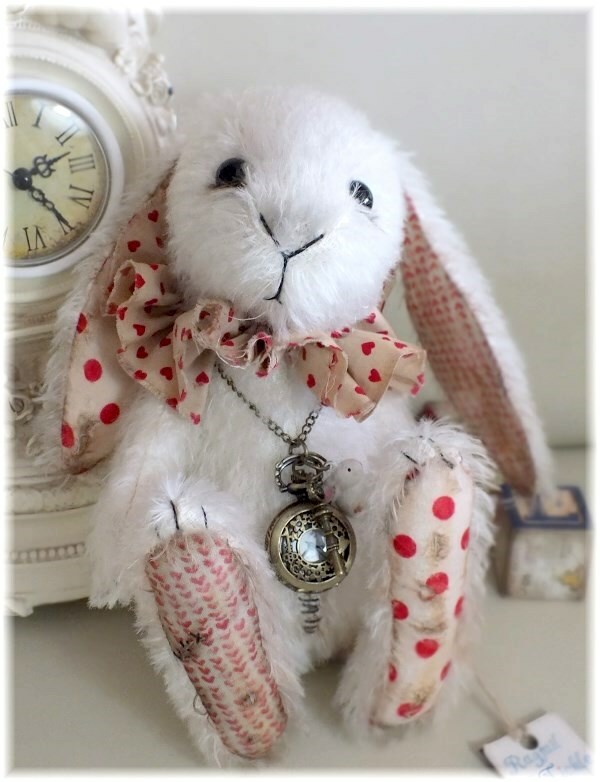 Anyway, this lovely white rabbit is made from an off-white soft mohair with beady black glass eyes. He has a mis-matched selection of red and heart themed fabrics for his ears and feet. He sports a number of time-worn accessories including a fully-functional pocket watch! He measures approx. 22cm/ 8.5 inches. He is weighted and fully-jointed. Mr Nincompoop is indeed a little bit mad! 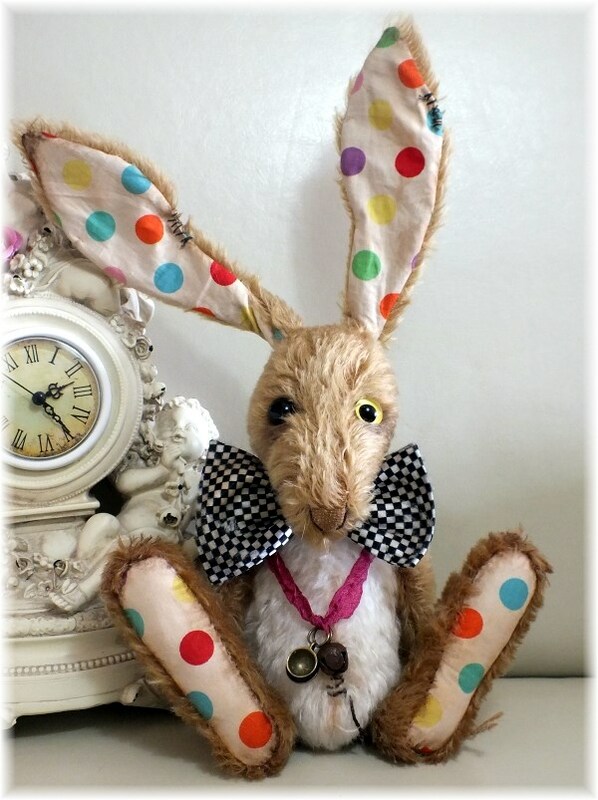 He's allowed to be, he's the mad March hare! Great fun, his eyes are mis-matched glass (one black, one black/yellow), his ears are wired and fully posable, he is made from a pale caramel coloured mohair. He wears a crazy looking bow tie and comes with various time-worn accessories. He is weighted and fully-jointed, and measures approx. 9 inches/23cm (not including his ears). 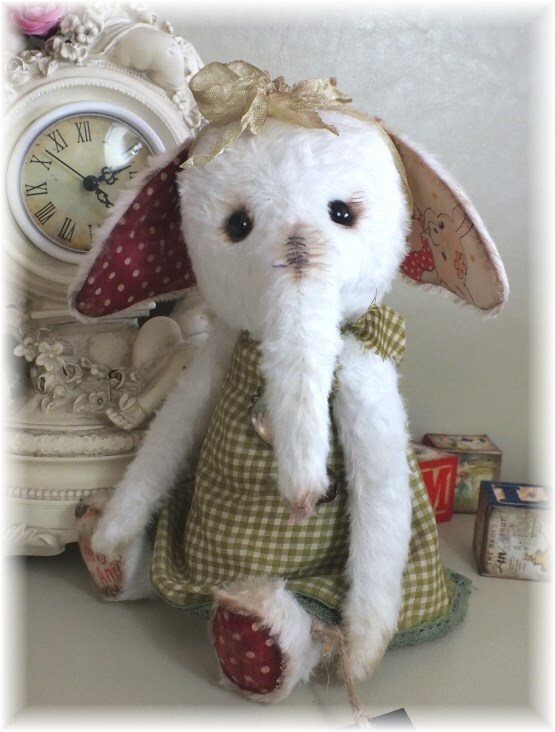 Patty Cake is a very sweet young elephant made from a very soft fine faux fur fabric called 'minky'. She's an off-white colour, accented with vintaged fabrics, a moss green ginham dress and various time-worn accessories. She has black glass eyes, she is weighted and fully jointed. She measures approx. 9 inches/23cm. 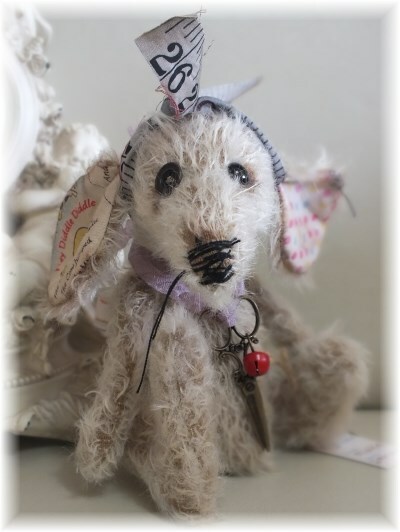 Minikin is a fabulous fabric mad vintaged mouse, in a two-tone beige shade mohair. Little black glass eyes with lovely time-worn details, such as a pair of scissors around her neck and tape measure head ribbon. She measures approx. 6 inches/16cm. She is weighted and fully jointed. The item has been 'vintaged' to give it an old authentic antique feel. She comes with her own 'reel' of cotton! Not pictured but included. 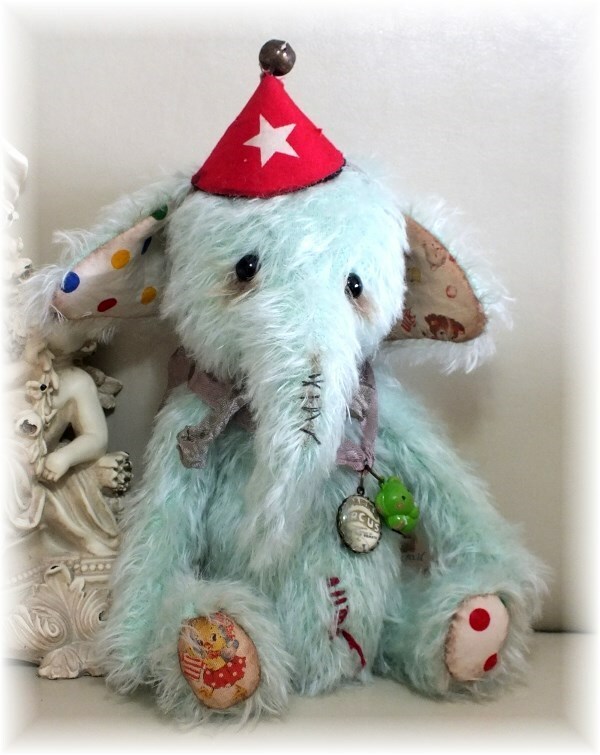 Hecky Thump is such a cute character, made from fluffy soft mohair in a lovely vintage turquoise blue and accented with mis-matched fabrics. 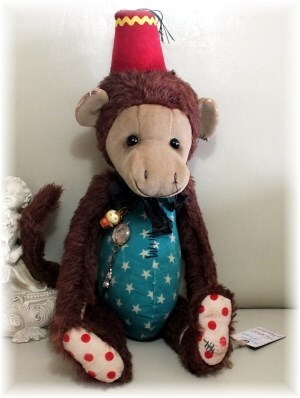 He has a little pointed hat with various time-worn accessories. He has black glass eyes, he is weighted and fully jointed. He measures approx. 9 inches/23cm. 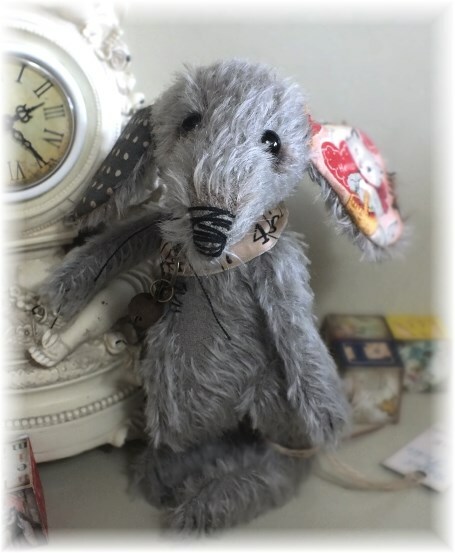 Nibble is a little sweetheart of a mouse, in a mid-grey fluffy mohair. Little black glass eyes with lovely time-worn details, such as a pair of scissors around his neck and tape measure neck-scarf. He measures approx. 6 inches/16cm. He is weighted and fully jointed. The item has been 'vintaged' to give it an old authentic antique feel. 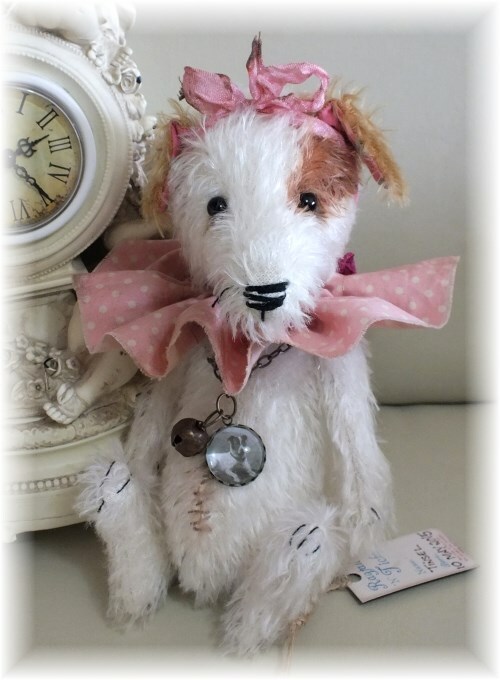 White & brown Jack Russell dog called 'Tinsel', she is such a sweetie! She is 20cm/8 inches tall. Fully jointed, in mohair and weighted. 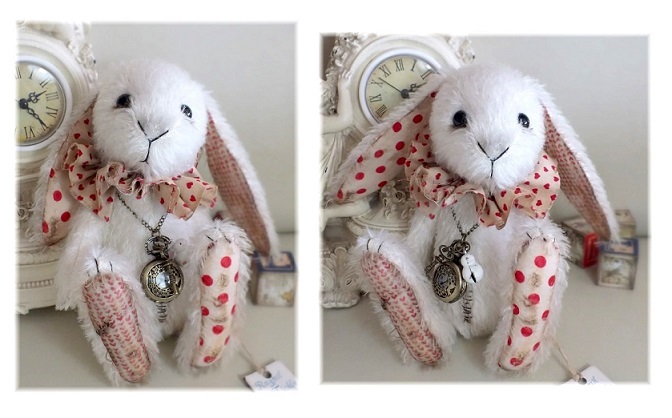 She has glass eyes and various time-worn accessories such as a vintage pink polka-dot fabric ruffle and a dog-chain with bell and a photo pendant of her time in the Circus trade. She is now in need of a new loving forever home! Malarkey sits so beautifully and he could easily be Victorian as he has been designed with so much care and attention to detail. He has been purposefully 'aged' and 'worn' and he's just superb. 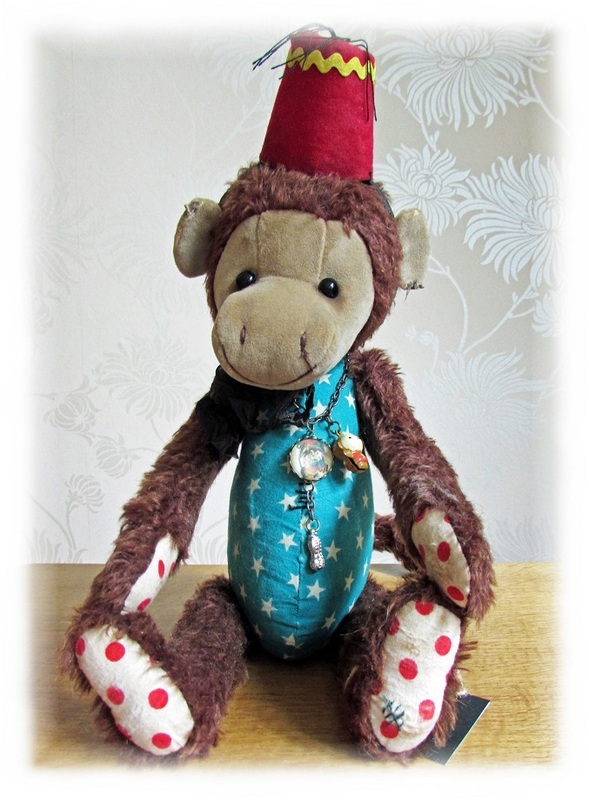 With Fez and some monkey type accessories (including a silver monkey nut) this little chap was made to be adored. He's weighted, he has a chocolate brown mohair to head, limbs and tail. 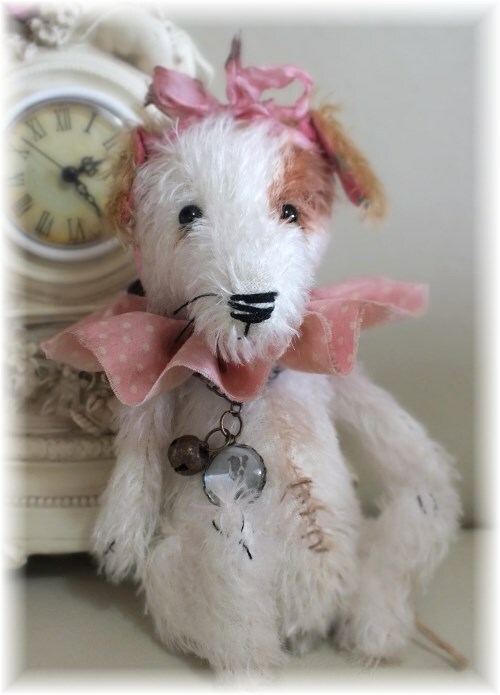 A plush face and ears in pale caramel, black glass eyes and a tail that is wired to be posed as you will. In length he is approx. 15 inches (including hat and in stood position. Jointed. The smaller of the 2 piglets, Teacup is such a little sweetie. 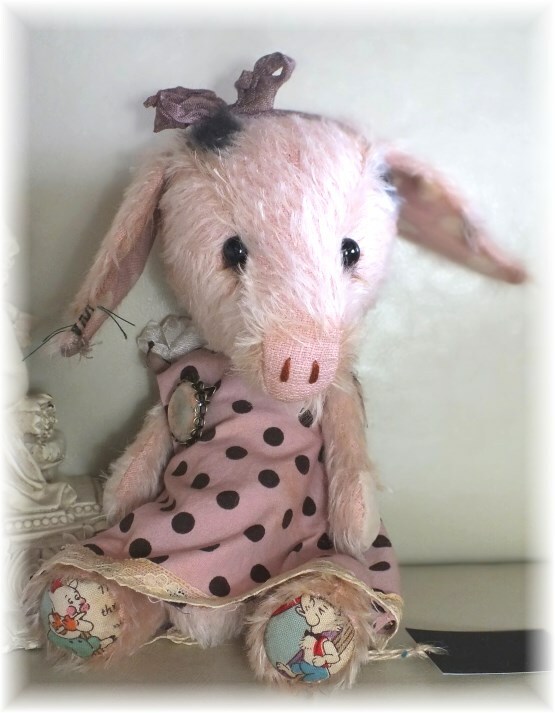 In pink mohair, black glass eyes, weighted, jointed, wearing a pink and brown polka dot dress and various time worn accessories – this one will definitely be your cup of tea. Laid out her length is 8 inches. Teapot is kind of a sad looking piglet, her head hangs in a rather down hearted way. Sister to 'Teacup' she's just as cute as her liitle sibling. 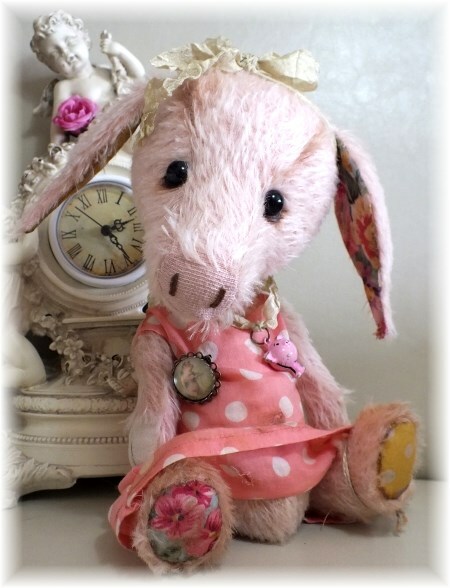 In pink mohair, black glass eyes, weighted, jointed, wearing a pink and cream polka dot dress and various time worn accessories – this one will definitely be your cup of tea. Laid out her length is 11 inches.